My youngest sister flew back from the East Coast tonight after being out there for roughly three weeks. My parents, Aaron, and I met her at the airport and then went out to a place called Sobahn, a well-rated Korean restaurant in Kansas City. We had been wanting to try it for awhile so it seemed like the perfect opportunity. Plus, we were in the mood for the cuisine because Aaron and I had spent 20+ hours over at my parents’ house this past week watching a show my mom told us we’d love called 킬미힐미, or Kill Me, Heal Me. There’s only so much Korean food you can see before you began to want it. Anyway, Sobahn. According to The Kansas City Star, Sobahn, at least as far back as 2011, was run by chef Susana Kwon and her two daughters. The Star says that Kwon’s husband and co-founder, Paul, passed away unexpectedly in 2010, just a year after it opened its doors. The mission of the restaurant is to serve the type of wonderful, casual home-style dishes you’d get in a family setting in and around Seoul as the owners wanted to share their culture. We pulled into the parking lot between 7:15 and 7:30 p.m. if I remember correctly and spent an hour or two indulging in a wide array of amazingly delicious dishes. 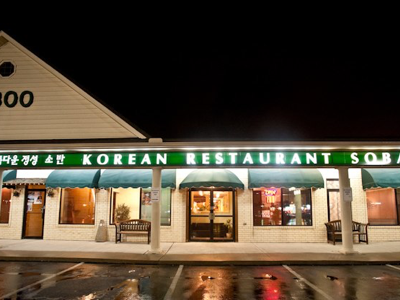 Seriously, if you like Korean food or are up for trying it, drive over the first chance you get. Located at 788 Shawnee Mission Parkway in Overland Park, it’s a convenient trip from practically anywhere in the metro area. You can’t miss it because – I kid you not – it’s located right near a Korean grocery store, a nail salon, a massage parlor, and a Kia dealership. (I can’t help but go into economist mode when I see that. You know from the Federal Reserve data that self-employed people, as a class, tend to have a much higher median net worth than those who work for others, and it’s been an oft-studied phenomenon since the 1970’s that, dollar for dollar of income, due to certain cultural values Korean-American immigrants bring with them, they have a 5x probability of making it to self-made millionaire status compared to what they should (see work of Dr. Thomas J. Stanley). I’m not even joking when I say I’m tempted to pull the property tax records and find out who owns the strip mall because I’d be surprised if it wasn’t somehow an equity or debt investment of one or more of the entrepreneurs operating within or near it or a member of their family.) It’s definitely a laid-back atmosphere, though, so don’t try to rush it if you go in for lunch or dinner and need to be in and out quickly. To us, that was part of the appeal and one of the things that made it unique. You could tell it was a family business into which someone had poured their heart and soul. Aaron and I will probably be back sometime before the end of January. I didn’t manage to take pictures of everything at the table because I was too busy eating well – my mom ordered bulgogi, which was fantastic (her comment: “I could eat this morning, noon, and night”), and my youngest sister ordered galbi steak, which was good – but I did snap a few photographs when I wasn’t smiling, sighing, and shoving banchan in my mouth. 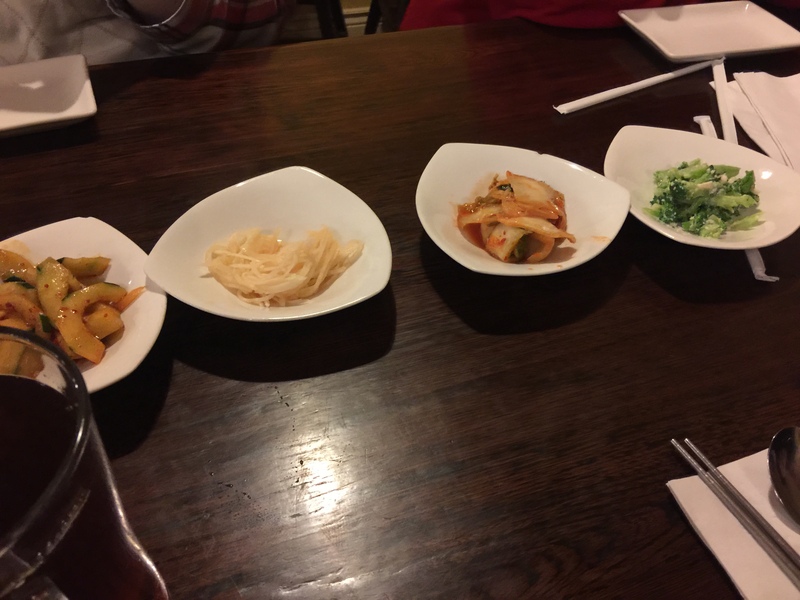 The banchan included white raddish, spicy cucumbers, kimchi, broccoli with tofu, and fish strips, the latter of which is not pictured and off to the left. I took a serving of the japchae from the big bowl in which it arrived (japchae is a dish consisting of glass noodles made from sweet potato starch in sesame oil with vegetables). The flavor was definitely one of the best things I had in a long time. 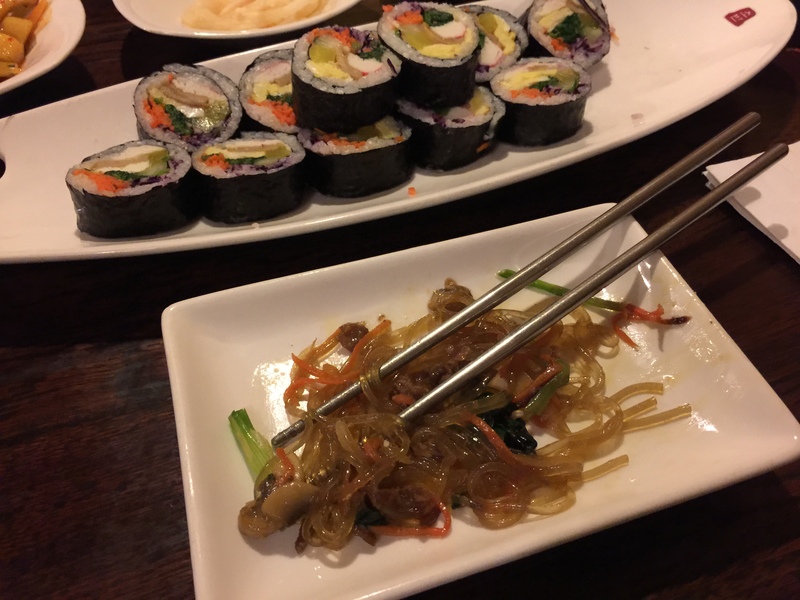 We also had kimbap. 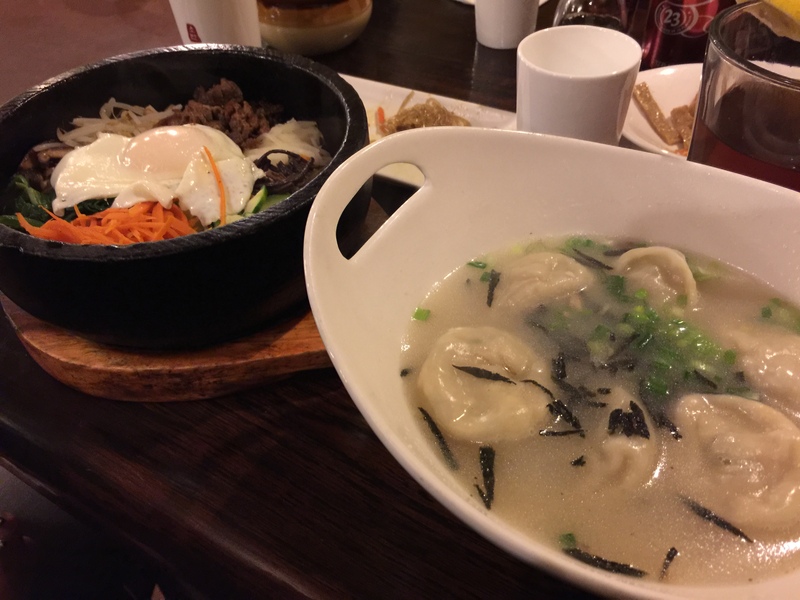 Aaron and I ordered a third entree between us to try – a bowl of mandu guk, which is dumplings in a beef broth (they extract the flavor by boiling the bones for twenty-four hours) – which we ended up saving in takeout because it was too much food. It was good. Aaron’s main entree was dol sot bibim bap. The stone bowl was so hot that when he poured in soy sauce and hot pepper paste sauce it would still boil ten or more minutes into eating. 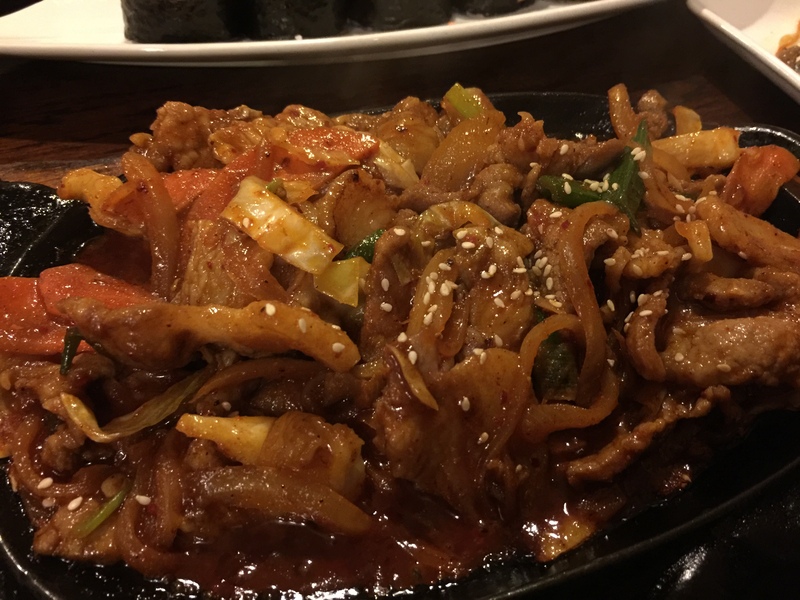 My main dish was jaeyuk bokkeum, which was spicy pork with vegetables. It was incredible. I’ll probably order it again the next time we go back to Sobahn. The flavor of the drippings with the rice was out of this world delicious! It’s somewhat similar to the sauce that develops in that rainbow beef stir fry Aaron and I make. 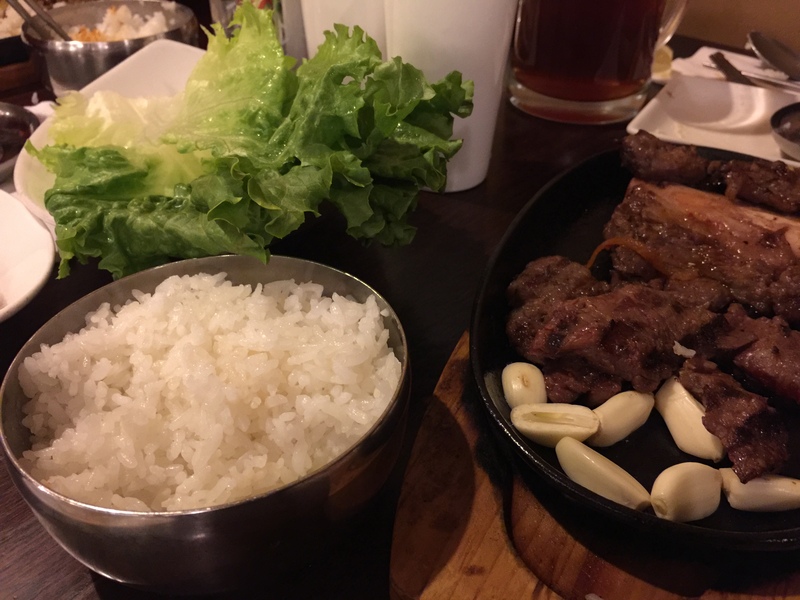 My dad ordered Sobahn’s Tong Galbi, which is hand sliced beef short ribs that you can put in a lettuce wrap with rice and a bean paste sauce. They were delicious, too. If you are in or around Kansas City and give Sobahn a try, let me know what you think about it. They have pictures of the dishes on their website so you know what you’re ordering beforehand (see earlier link); the chef will do custom events and menus for events, birthdays, corporate get-togethers, or groups. I’m thrilled to have discovered this place and can tell we’ll probably make it a regular thing.